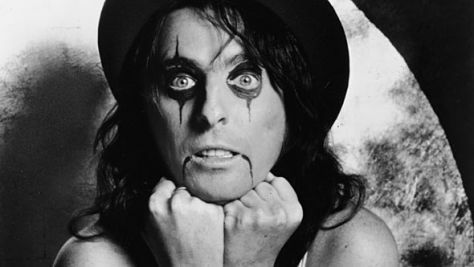 Funny; Alice Cooper doesn't look that excited that school's out. Time frame disclaimer: this post, started two nights ago, with two days of school remaining, is being finished four hours after the buses rolled away, carrying away children from the very last day of school. It's the best of times, the worst of times, the timeliest of times when teachers and students are united around one basic measure: the countdown to the last day of school. It's been running in the staff room for at least a month now, the counter on the whiteboard ticking off how many student contact days remain. Last week, I noticed it was also on a small sign just inside the entrance: how many "wake up days" remained for students. The most unavoidable measure of time remaining, though, has been the students themselves: fifth graders behaving like Soviet engineers counting down their last days on a meter stick, feeling more entitled to talk back with each successive day. This is not just a Reynolds phenomenon: two weeks ago, when I interviewed at a school in an upper-middle-class neighborhood in Tigard, the principal commiserated on how unmanageable her fifth graders were getting. This explains the burnout being felt by nearly the entire staff at Margaret Scott, as well as by the majority of students whose behavior adheres more closely to classroom expectations: We're done. We've held it together for an entire year, handling explosive children with as much equanimity as we can muster, struggling to maintain our cool as children talk back to us more and more stridently, refusing to cooperate, to let the lesson unfold, to permit their peers to learn something, anything, other than how much power one or two children can have in a school that has no effective means of moderating their behavior. We want it to be over, can't wait for it to be over, and that impatience is having an impact on our own effectiveness as students and educators. "Self Managers" (well-behaved children who are given extra privileges and responsibilities) have been shirking their task of being role models, and children who fall somewhere in between have begun to take their cue from the high flyers instead. The chatter level is up in every class, and the most difficult classes are marked by screaming and acts of physical aggression. One last time shift: I'm finishing this post from the far side of the maelstrom. It's Saturday morning now, two and a half days since I waved to the departing buses. The last day--field day--was a day for as much fun as could be had with children who wanted desperately to get on those buses, and yet were terrified of what that might mean for them. Here's where the poignance kicks in. Just over a year ago, during my one semester at Hartley School, my principal there sent an email to the entire staff, acknowledging the craziness that was growing throughout the building, pinning much of it on children just starting to realize how much they were going to miss us. Two years after meeting most of the children I teach, I have a far better sense of what that means. Many of these children are going to spend the next three months in a home environment utterly lacking in structure. They will be on their own for much of the time, unsupervised because whatever adults are responsible for them can't afford child care during working hours. Their parents are challenged in ways I can't begin to imagine: un- or underemployed, struggling with abusive relationships, fighting over custody, addicted to multiple substances, homeless, struggling to cope in a culture that speaks an alien language, having to rely on their children as interpreters. Many of the older children are on junior assistant parent duty, watching siblings while their parents are absent. Summer is an ordeal for children in situations like these, made more difficult by the loss of emotional support that comes with school being out. I've been applying for other jobs for over a month now. I'm doing it to decrease my commute, to find a school and district with a truly supportive administration, and a dedicated music classroom I can count on being there when I enter the building in September. After what I've written, you could be excused for thinking I want out from Margaret Scott because of the extreme discipline issues, but that's not it at all. Knowing what a pressing issue that is for every teacher at Scott, I'm confident that the interview team will be seeking out a new principal who makes this a priority. In fact, I don't relish the idea of leaving these students behind. As I explained to that Tigard interview committee, I'm ambivalent about changing jobs, and all that ambivalence comes from the children at this school who, should I land a westside job, will have one more new face to get used to next fall. These children have so little stability in their lives. They deserve some continuity. Realistically, I will very likely be providing that continuity for them. As an older white male who is not (and even with intensive training, probably cannot be) bilingual, and whose experience and education place me rather high on the pay scale, I've got a lot of checks against me in the hiring process. To even consider me for a position, an interview team has to be dedicated solely to the highest principles of music education. That's what got me that interview in Tigard, and why, after meeting with the team and teaching a model lesson for them, I wanted very much to have that job. But I didn't get it, and haven't had any other nibbles, despite applying for copious openings in the Beaverton School District. So I'll probably be back at Scott in the fall, very possibly teaching in the gym again. I'll grumble a lot, come home too tired to play--and yet, at the same time, I'll be doing the work I love, with children I love, and most of the time, it'll be just fine. And really, that's what all teachers, not just the Reynolds teachers, but teachers in every district, every school, however well-behaved their students, is feeling right now. We made it. Our students made it. In three months, we'll start making it again, holding everything together as best we can, loving most of our job, surviving the parts we don't love, initiating another generation of kindergartners into the primary culture, preparing another generation of fifth graders for the intermediate culture, smiling, hugging, admonishing, teaching, loving.